Monitor and report on the online activity surrounding research published by your faculty, and benefit from access to the full Altmetric database. Explorer for Institutions is an intuitive platform that enables you to monitor the online activity surrounding academic research. Browse by author, group or department for your own institution, benchmark against peer organisations, report on the outcomes of outreach activity, and integrate the insights the data provides into evaluation and review processes. Evidence the reach and broader influence of your work to funders to help them understand the benefits and intended impacts of your research. See who is talking about your research, where they are, and what they’re saying. Full visibility of the online conversations means you can ensure your work isn’t being misrepresented or misinterpreted. Understand where and why your research outputs are attracting attention, and use our fully auditable data to identify successes and key channels. Enable faculty to easily track the activity surrounding their research, better manage their online reputations, and uncover examples of the broader impacts of their work. Demonstrate the value and profile of your research programs and faculty to internal and external stakeholders to encourage support. Analyse attention data to guide future research, recruitment and outreach program planning. Determine key paths to success and prioritise activities accordingly. View attention data by author, group, department, or across your whole institution. Filter by attention type and monitor patterns in real time. 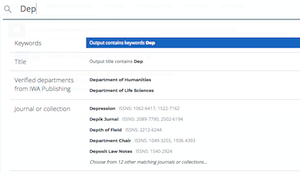 Advanced search capabilities make it easy to browse and filter attention data for the 7 million+ research outputs tracked by Altmetric to date. Attention summaries, news highlights and demographic data enable you to conduct further analysis and report on key achievements. Easily create publicly shareable reports based on your preferred search filters, and call up old ones with a single click. Want to see where your research has been hitting the headlines? The attention highlights tab provides an at-a-glance overview of where publications have been feature din high-profile media outlets. Export sets of research attention data to perform additional analysis or to create further graphs and visualisations. 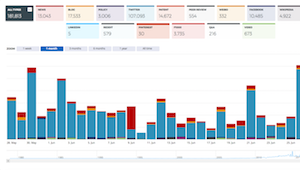 Already have an internal reporting system and want to add Altmetric data to it? Use the API output to sync the database to suit your needs. 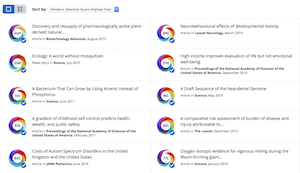 Via the Altmetric details page we show you all of the original shares and mentions of each piece of research, so you can see exactly who is saying what about your work. When browsing the Explorer you’ll be able to use the score and donut as a way of easily identifying research that has had a high volume or a certain type of attention. New mentions and shares are updated as soon as we see them, enabling you to see how the way a piece of research is shared and discussed over time. Our data curation process ensures that all of the sources we track are relevant and timely – meaning you get the insight that matters most. Within the Explorer you can define what research you want to see data for by using our advanced filtering options, or inputting your own PubMed queries. Counts of the mentions for each research output can be exported to excel or via the API. Create custom reports and register to receive regular email alerts and updates to stay up-to-date with the latest activity. How are other institutions using it? Head of Research Information Juergen Wastl shares Cambridge's experience of integrating the Altmetric Explorer for Institutions. Populating the Explorer for Institutions is straightforward and easy: our dedicated Implementations Manager will be there to guide you through every step of the way, and we’ll provide training and support to help get you started. Access to the Explorer for Institutions is made readily available for all of your faculty via site license IP-authentication. Users have the option to just browse, or to create accounts to enable them to save reports, set up alerts, and create custom groups.